Lieve is a civil engineer (ir) and a professional musician. After years of teaching and research (project management/eLearning/instability) she is now a freelancer specializing in advanced Adobe Captivate as trainer and consultant. Her blog is popular with Captivate users worldwide. As an Adobe Community Professional and Adobe Education Leader, she has presented both online and offline. Since 2015 she is moderator on the Adobe forums and was named as Forum Legend (special category) in the Wall of Fame. In 2017 Adobe Captivate users voted for Lieve as a Top Content Experience Strategist. Consultant and Trainer for Advanced Captivate. Specialized in personalised training for individuals or groups, live and online. One drop target, based on my answer to the other question, it accepted all drag sources but only one by one. When dragging another source it would replace the first one. D&D slides are automatically pausing at 1.5secs but that is NOT visible on the Timeline, only in the Timing properties, whereas for quiz slides the pausing point is visible on the Timeline but NOT in the Timing Properties. This is confusing. D&D slides have an On Enter event and an On Exit event, whereas quiz slides only have an On Enter event. That is OK. Submit button both for D&D slides and for Quiz slides have one or two events, depending on the number of allowed attempts. For quiz slides, the actions triggered by those events will happen after the first step of the Submit process (where feedback messages appear), for D&D slides there is only one step in Submit process. That is OK, you just have to realize that. If the number of attempts is limited you have two events: you allwasy have the Success event. That event and its linked action occur when the answer is validated and correct. That is fine, works the same for quiz and D&D slides. If you want to give the learner the time to read a Success message, which can appear automatically you have to leave some time to the learner by choosing the correct action On Success. Example: if you set the Success action to ‘Go to Next Slide’, learner will not be able to see a Success message. Change to ‘Continue’, and eventually increase the duration of the slide. Works fine, just that slight difference. If the number of attempts is unlimited you have only one event, the Success event. It is logical because you are supposed to try until you get the correct answer. For quiz/KC slides this is very clear because the Last Attempt event is dimmed when you choose for unlimited attempts. However for D&D slides the (alreadly wrongly labeled) Failure event is not dimmed, although it will never happend. This is very confusing IMO. Sorry for this long explanation, needed to understand the workflow I explored to answer the question mentioned in the intro. I hope some of you, readers, will support my feature requests to ‘repair’ the UI and avoid confusion. Both situations are considered Failures, but Failure doesn’t generate an event until the last attempt. Since it is set to Unlimited Attempts, there will never be a Failure event. No way to replace the messages by custom text containers, if you cannot trigger advanced/shared action on Failure. The popup messages (Success, Failure) cannot be controlled, they don’t have an ID. You can create states for such a message, but since you cannot address the message, you cannot change the state by an action. 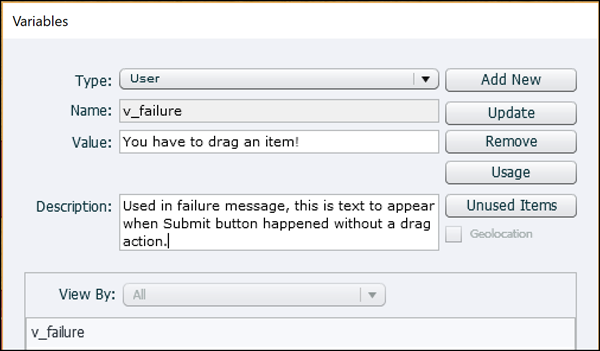 A possible solution is to replace the text in the Failure message by a variable, in this case I labeled it v_failure. It is possible to change the value of a variable. The value of the variable has to change when at least one drag action has happened, which was not the correct action. Besides the events occurring after clicking the Submit button, D&D slides have also Object Actions. I will use those actions to assign another value to the variable v_failure. 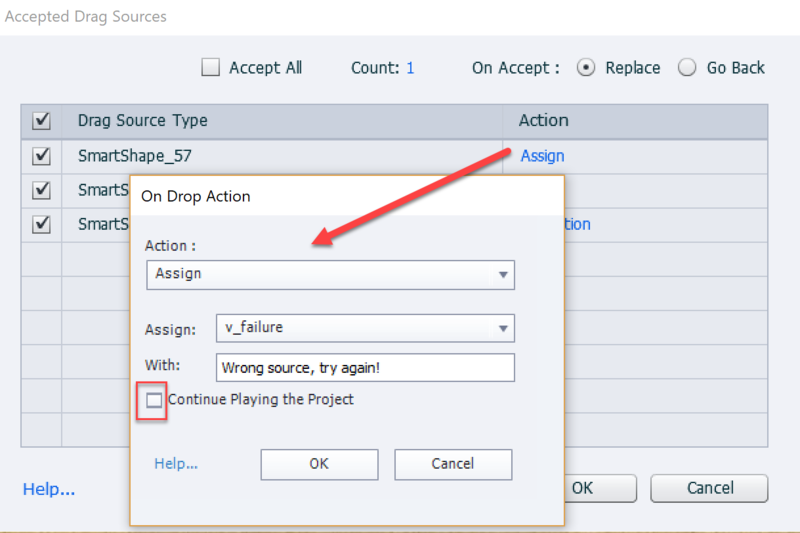 Open the dialog box in the Format tab for the selected drop target. In this very simple example, I used an Assign command as you see in this screenshot. I only needed it for the two wrong drag sources. 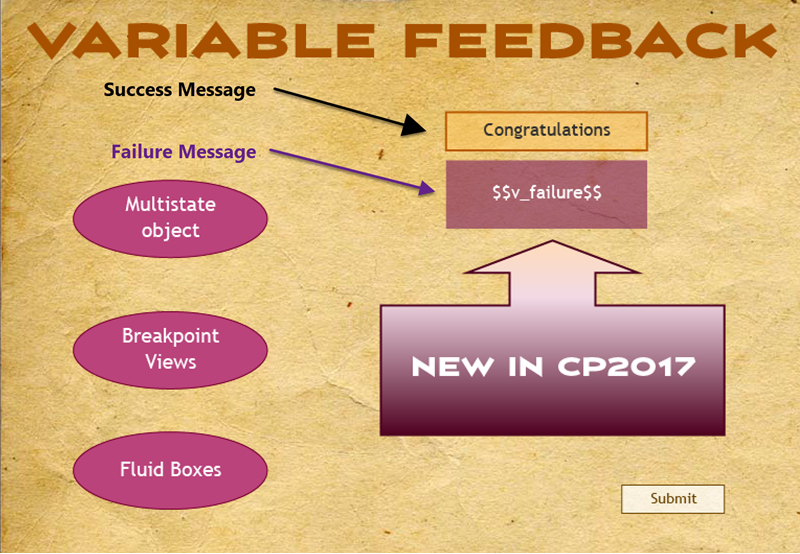 For the correct source, no need to change the Failure message, since the Success message will appear. Since I used a simple action, needed to uncheck the box ‘Continue Playing the Project’. If you need to change a lot of those actions, and it is OK to have always the same Failure message, please create an advanced (oneline) action, will save you time when applying in the Object Actions. If you want a different feedback message for each wrong source, use either the Assign command (as above) or use a shared action.